GoDrive provides Enterprise File Sync and Sharing (EFSS) services for your employees and partners. With GoDrive, files and folders can be easily shared between users with advanced collaboration features including file revision tracking, commenting, trash bin, media viewing and synchronization with Windows, Apple and Android devices. GoDrive is your best alternative to cloud-based file sharing services. It provides on-site file storage with localized control, end-to-end encryption, and detailed audit trails. View our detailed brochure on GoDrive for Collaboration. Sharing files with others is a snap using GoDrive. We even give you 10 FREE Users to get started. GoDrive provides end-to-end encryption for sensitive files. Since no files are stored in the cloud, your organization maintains local control to meet compliance requirements. 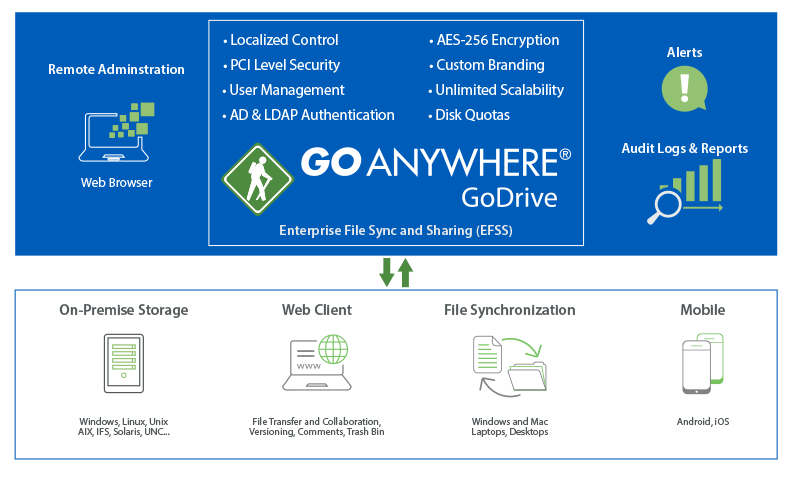 Included with GoAnywhere MFT, GoDrive provides a browser-based interface for administrators to easily manage users, security settings and shared folders. The GoDrive Sync Client for Windows and Mac will synchronize your files from the GoDrive folder on your workstation with the GoAnywhere MFT server. Files automatically appear on each of your registered devices, as well as the Web Client, allowing you to access your files from any internet connected computer. The GoDrive Sync Client for Windows supports Kerberos Single Sign-on for easier adoption by your users. The GoDrive mobile app allows you to access files on your iPhone, iPad, and Android phones and tablets for your authorized account. These files can be previewed or optionally downloaded for offline access. Your files and folders will be automatically updated to the most current version each time you connect to the server. Capturing detailed audit log information and exporting for reporting purposes is a cornerstone of GoAnywhere MFT. GoDrive logs each time a file is uploaded, downloaded, edited, shared, commented on, and deleted. Clustering provides scalability that allows GoDrive to support thousands of users while active-active maximizes availability for mission critical file sharing. Request a quote to implement file sync and sharing using GoAnywhere MFT.